According to the latest market report published by Transparency Market Research, titled 'Orange Extract Market: Global Industry Analysis 2013-2017 and Opportunity Assessment 2018-2028', revenue generated from the global orange extract market has been estimated to be valued around US$ 536.2 Mn in 2018, which is projected to increase at a CAGR of 5.1% during the forecast period (2018-2028). 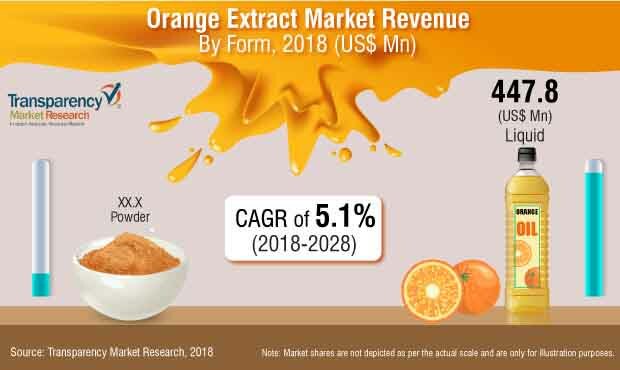 Driving factors such as the demand for fresh fruity flavors, consumer preference for natural food additives, and health consciousness contribute to the accelerating growth of the orange extract market. Orange extract is highly consumed in the North American region, expected to account for around 34.4% share during the forecast period, owing to highest utilization in the region. Increased market penetration in developing and developed economies makes the orange extract market a highly competitive one, resulting in continuous product launches by the key players of orange extract. Players in the market such as Döhler GmbH and McCormick & Company, Inc. are well-known for their premium quality of orange extract. These companies spend appreciably on promoting their brands online as well as other channels, and hence, have high visibility and premium placement on retail shelves. Thus, consumers are more inclined towards buying branded orange extract as a sign of premium quality. Being a developing economy and with an increased number of food processing industries, Asia Pacific holds the highest market share in the orange extract market as compared to other regions, due to the highest consumption of orange extract, factors such as favorable government policies on natural food additives, and inclining application of orange extract in cosmetics and personal care products. It is anticipated that the Asia Pacific except Japan region would witness a high growth rate of the orange extract market - 7.3% growth during the forecast period. Increasing consumer health consciousness regarding natural food products in recent years has been a major contributing driver for the global orange extract over the years. Organic orange extract is expected to have a high preference as compared to conventional orange extract during the forecast. By nature segment, the organic orange extract segment is anticipated to witness the highest compound annual growth rate of 5.1% during the forecast period. However, the organic extract segment has a minimal market share at present, due to the market being huge for conventional orange extract at affordable prices. Due to the growing demand for orange extract across developing countries, manufacturers have been coming up with the powdered form of orange extract in recent years. This practice is not only expected to ensure for a healthier food additive and quality fruit extract, but also promotes the extended domestic consumption of orange extract in the upcoming years. For instance, China and India have been developing a powdered form of orange extracts in recent years. This report covers the current trends driving each segment, and offers detailed analysis and insights into the potential growth of the global orange extract market. The final section of the report contains a competitive landscape of dynamic players, to provide an audience view with a comparative dashboard. Key players covered in the report are the current dynamic manufacturers in the orange extract market. Detailed profiles of the manufacturers are also included in the scope of the report to analyze their long-term and short-term strategies, key offerings, and recent developments in the orange extract space. TMR has profiled some of the most prominent companies active in the global orange extract market, such as Döhler GmbH, McCormick & Company, Inc., Southern Flavoring Company, Inc., Cook Flavoring Company, LorAnn Oils, Nature's Sunshine Products, Inc., Nielsen-Massey Vanillas, Inc., etc. Key manufacturers and product developers in the global orange extract market are producing organic orange extract, not only for applications in food and beverages but also significantly contributing to the development of cosmetics and personal care, thereby attracting a huge customer base in the global orange extract market.